Creative thinking is what you do when you are being creative and creativity is the outcome of this. Creative activity is purposeful and generates something which is to some degree original and of value. Almost always creative thinking is a social activity and almost always it takes place in response to an issue or problem facing an individual or group. It is a multi-dimensional concept as the model below suggests, being made up of a cluster of five creative habits – being imaginative, inquisitive, persistent, collaborative and disciplined. According to researchers, it is important both for developing creative people and because it also helps to boost student achievement. It has powerful advocates in Sir Ken Robinson, Matthew Taylor and Professor Michael Fullan. It makes us more employable according to the CBI. But while it is increasingly valued across the world, you do not find creative thinking on the timetable of secondary schools. This is partly because secondary schools organise their curricula around subjects, mainly those which are examined at GCSE and increasingly with half a glance over their shoulders to their Attainment 8 and Progress 8 scores. But even given these constraints, a growing number of secondary schools are explicitly teaching creative thinking by embedding it within the lessons and within the co-curriculum and by choosing teaching and learning methods which enable it to flourish. So, if you wanted to teach someone how to become more creative and better able to solve problems, what methods would you choose? The schools which are cultivating creative thinkers tend to use a four-stage process like this. Develop real understanding of creative thinking. Establish a conducive classroom climate and use two key strategies. Choose pedagogies most suited to creative thinking. Build learner engagement and commitment to the capability. This requires teachers to become more precise about what they are trying to teach, just as they would if they were introducing a new history or science syllabus. The 15 phrases around the edge of the wheel – playing with possibilities, challenging assumptions, tolerating uncertainty and so forth – are good prompts to the kinds of activities which teachers might select. Stage two involves the creation of a conducive climate offering opportunities for exploration, risk-taking and mistake-making, exciting and unusual contexts, free-flowing thinking and critical reflection in which students are encouraged to take responsibility for their own learning. It is also facilitated by two core processes, split-screen and visible thinking. Split-screen teaching invites teachers to describe two worlds or “screens”. As part of the evolution of Professor Guy Claxton’s Building Learning Power, teachers have found it helpful explicitly to think about their teaching as having these two screens – one is the knowledge and skills they are seeking to impart, and the other is the creative habit on which they are focusing. Let’s say you were exploring the causes of the First World War in a history lesson, students would be asked at the same time to be exploring aspects of critical thinking such as the use of primary sources of evidence. In the imaginary split screen of the lesson and its objectives, a teacher would take care to explain to the class that both the historical and the creative thinking objectives were equally important. The visible thinking approach initiated by Harvard University’s Project Zero has identified a number of important thinking routines which help pupils to develop creative thinking. Routines exist in all classrooms and they can either be helpful to the development of creative thinking or less so. A routine such as “What makes you say that?”, which asks students to describe something, such as an object or concept, and then support their interpretation with evidence, helps students to learn how to challenge assumptions. Or “Think-Puzzle-Explore”, which invites students to think then puzzle then explore ideas when they are beginning a topic to help develop their own questions to investigate. This then sets the stage for wondering and deeper questioning and inquiry. Stage three invites teachers to make the best possible choices about their teaching methods. 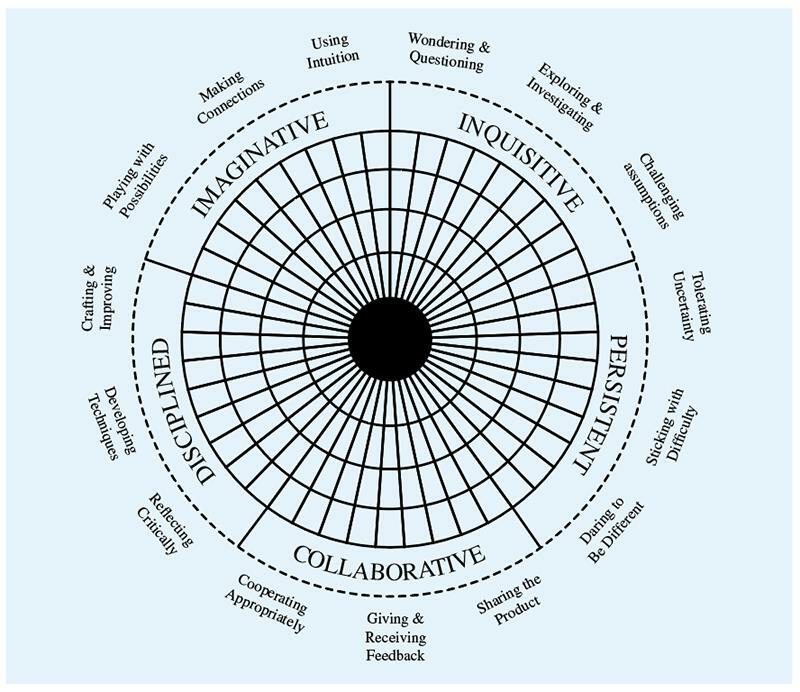 Here it may be helpful to consider the idea of “signature pedagogies” – the kinds of learning methods most suited to a particular desired outcome (with regard to creative thinking, our desired outcomes are the 15 skills around the outside of the wheel). By “signature”, I mean those methods which are most closely associated with what we want to learn. Such methods are, if you like, the unique DNA or fingerprint of creative thinking. Problem-based learning – learning that starts with real-world problems and, through a rigorous process of enquiry, enables learners to conduct research, integrating both theory and practice, and apply their knowledge and skills to develop potential solutions. Classroom learning community – an approach to teaching and learning which is deeply social where the goal is to advance the collective knowledge of a class and so support the growth of their individual knowledge. Playful experimentation – we mean the conscious, often playful, sometimes non-conscious generation of new ideas as well as more explicit approaches to synthesising knowledge and experiences. Growth mindset – the term coined by Professor Carol Dweck which is strongly linked to another idea, associated with Angela Lee Duckworth, grit. Learners need to understand that their capacity for intelligent thinking and behaviour can grow as they practise things. Deliberate practice – a series of highly structured activities such as drafting, re-drafting, prototyping, and rehearsing, undertaken with the specific goal of improving performance. This stage is a reminder that young people are natural born creative thinkers and can develop the kinds of creative habits I have been describing in many aspects of their life, not just at school. Schools actively seeking to cultivate creative thinking tend to have vibrant co-curricular programmes and encourage students to share their outside activities with other students and teachers. Of course doing anything in secondary schools which does not readily fit within existing structures calls for leadership, for school leaders and teachers who recognise that this valuable capability can indeed be embedded within subjects, can thrive in cross-curricular work and sits well in well-organised projects which connect to the genuine interests of their students. From the research we have been undertaking for nearly a decade I am convinced that secondary schools are increasingly recognising that they wish to and need to see the world through a more creative lens than the more fragmented subject-based one which many of them find themselves in. Most importantly they realise that this is not an either-or option, either teach the basics or opt for creative thinking. Instead they see that a well-planned fusion of both approaches is the most likely one to bear fruit. Professor Bill Lucas is director of the Centre for Real-World Learning at the University of Winchester. 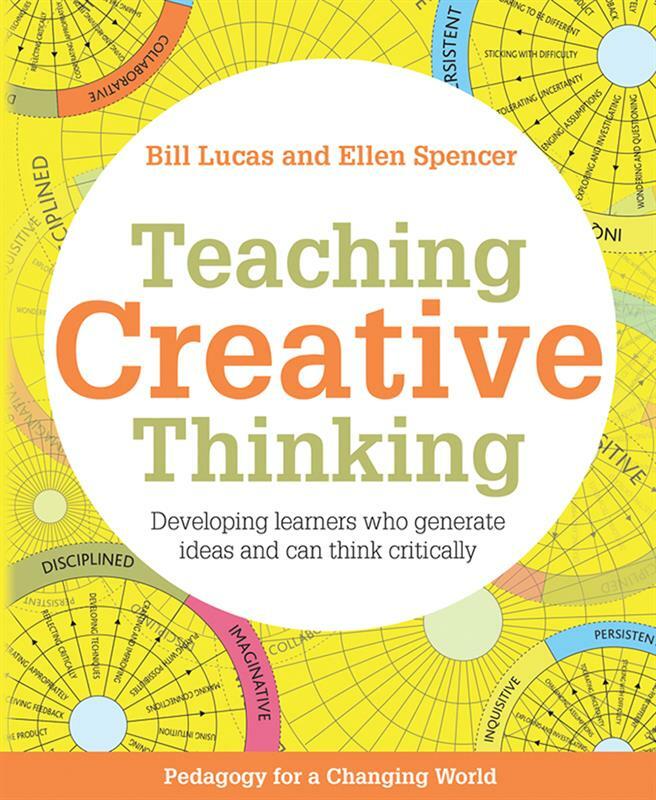 With Ellen Spencer he is the author of Teaching Creative Thinking: Developing learners who generate ideas and can think critically – a guide of practical ideas and case studies to help teachers.